Orgyen Menla Dütsi Bum Zang (Tib. ཨོ་རྒྱན་སྨན་གྱི་བླ་མ་མཆོད་ཅིང་ཐུགས་དམ་བསྐུལ་བའི་ཆོ་ག་བདུད་རྩིའི་བུམ་བཟང་, Wyl. o rgyan sman gyi bla ma mchod cing thugs dam bskul ba'i cho ga bdud rtsi'i bum bzang) ‘The Excellent Vase of Nectar, The Ritual of Offering and Invoking the Wisdom Mind of the Orgyan Medicine Lama” is a medicine practice based on Orgyen Menla, Guru Rinpoche in the form of Medicine Buddha. In the Tsokye Tuktik terma cycle of Dudjom Rinpoche, which is the lama practice of the Three Roots of the Dudjom Tersar lineage, Orgyen Menla is the outer aspect of Guru Tsokyé Dorje. In the Orgyen Menla Dütsi Bum Zang practice, the principal deity is Orgyen Menla. The practice is found in volume 16 (ma) of the Dudjom Sungbum, p. 603-610. I, Jigdral Yeshe Dorje, wrote this down as it occurred to me during the auspicious time of the thirteenth day of the seventh month, on the eastern side of the Rasa Trulnang [Jokhang] temple in Lhasa, in the immeasurable palace of Napö, Lovely to Behold. As written by Dudjom Rinpoche in the colophon of the practice, its purpose is “to clear away all temporary and long term deterioration that comes about through the disturbance of the elements and so forth of oneself and others”. Our destructible illusory human body is subject to temporary and long term deterioration that comes about due to the disturbance of elements. Sickness and obstacles will arise, threatening us with unbearable suffering and untimely death. 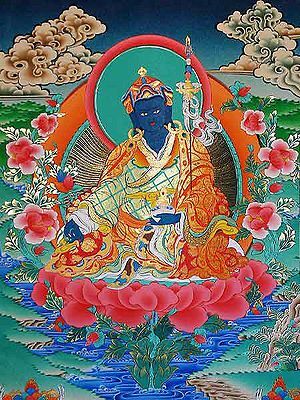 Before and at the time of the arising of illnesses we can always supplicate to Orgyen Menla, The King of Medicine, with strong faith. By being inseparable with Orgyen Menla, the sickness obstacles and suffering will definitely be removed so our life will not be exhausted. ”This practice focuses on the healing qualities of the Buddha’s luminous wisdom mind with the aim of curing all disease, including the very sources of suffering, for all parent sentient beings”. The Orgyen Menla Dütsi Bum Zang practice is either done as a daily practice, or within a drupchen, where treasure vases can be consecrated, and mendrup produced. The practice is also often accumulated in order to support long life for masters, in combination with their long life prayer and Seven Line Prayer recitations and accumulations. ↑ The Excellent Vase of Nectar, The Ritual of Offering and Invoking the Wisdom Mind of the Orgyan Medicine Lama, Dudjom Rinpoche, translated by Lama Yeshe Wangmo, Bero Jeydren Publications, Corralitos, USA, 2003. ↑ Instructions written for an Orgyen Menla practice at Yeshe Nyingpo, USA. This page was last edited on 14 June 2018, at 19:40.